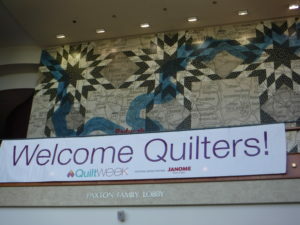 More than 30,000 visitors attend AQS QuiltWeek annually. 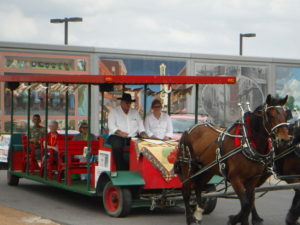 Hosted in Paducah, Kentucky, the home of the National Quilt Museum, the event ran from April 26 to 29, 2017. This international show featured more than 400 quilts by artists representing 40 states and 14 countries. I’m not a quilter, but even I stood in awe of the winners. 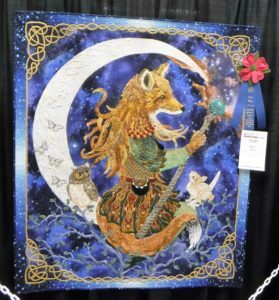 My hands-down favorite is Celtic Fox by Kathy McNeil, which won its division in wall quilts. My sister Patti’s own quilt, “Digging in the Dirt,” made the rigorous judging to be a semifinalist in the “First Time Quilters” division, competing against some forty others. 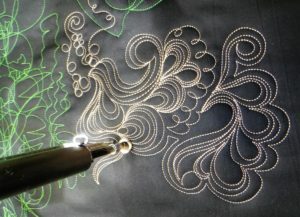 Check out her website if you need a talented longarmer to match the beauty and skill of your quilt. Unlike a sewing machine, where the seamstress pushes the fabric beneath the stationary machine, the long-arm glides along a range, moved by the seamstress. Upon completing that section, the longarmer rolls up the quilt to expose a new section of the quilt. addition, dozens of experts teach techniques or offer projects—I came home with fabric art I made in one such class, with silk the instructor hand dyes. The show’s so huge that it fills the Expo center plus a “bubble” tent set up across the way. 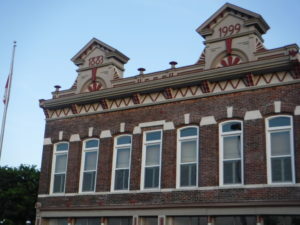 The National Quilt museum, a popular attraction with its ever-rotating stock of quilts, hosts extended hours. If you’re the show’s grand prize winner, the best quilt of all the quilts, you receive the highest sum if you release your quilt forever into the keeping of the National Quilt Museum. any day but Sunday. And if you’re there late enough on a Saturday, you might stumble upon their “buy a loaf, get loaf” special. For exceptional coffee, visit Etcetera Coffeehouse. Smooth coffees and a host of inventive combinations offered up by the barristas. Our favorite became the Israel, a salted caramel coffee, delicious hot on the cold day, and iced on the hot day. You’ve got to be fast on your reservations, or call after the Various “Quilt Week” deadlines pass. My sister and I love to stay at Auburn Place, a few miles out from the downtown. Pride in ownership means carpet that looks brand new, lemon water waiting for you downstairs, a selection of fresh fruit available all day, and coffee always available. QuiltWeek (the next one is September 13-16, 2017) or any other time. 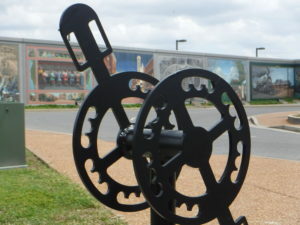 A city whose roots go back to water trade, and a textile town because of it, the historic downtown offers shops to pull you in and make you stay a spell, those eateries, and a mural along the floodwall. This was my third visit to Paducah, and it won’t be my last. 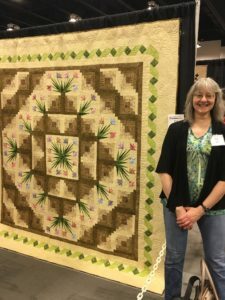 This entry was posted in Travel, Uncategorized and tagged AQS, Kathy McNeil, Paducah, Quilting, QuiltWeek, Threadworks Factory. Bookmark the permalink. That was, indeed, a blast. I loved every moment with you and I loved reading about it! Nicely done!!! I’d love to visit it with you again in 2018, whether QuiltWeek Spring, Fall if they do it again, or any other time (but hopefully not more of the heat advisories like our 2016 and 2015 visits! I think I know someone else who goes to this. It looks like a wonderful event. I don’t quilt — bare minimum sewing skills — but I love to see all the art and skill that go into these. Artistry beyond compare! Hey, you sew, and that’s the building block, and practical. I bought fabric two visits ago and my sis has designed a pattern we’re calling “Crossing Ohio.” But I MUST practice my quilting. I’ve done one pot holder as paper piecing, and that’s it!